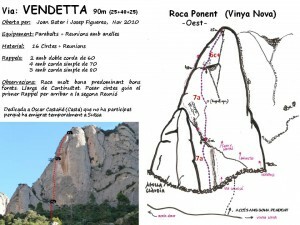 On a sunny November Friday we head to the magnificent Roca Ponent in the area called Vinya Nova on the South Face of Montserrat to climb the sports multi-pitch route “Vendetta”. We park the car at the spacious parking just below the Restaurant Vinya Nova (5 minutes’ drive from both villages El Bruc and Collbató): the wall is easy to identify looking towards the mountain into the wide valley behind the restaurant building. 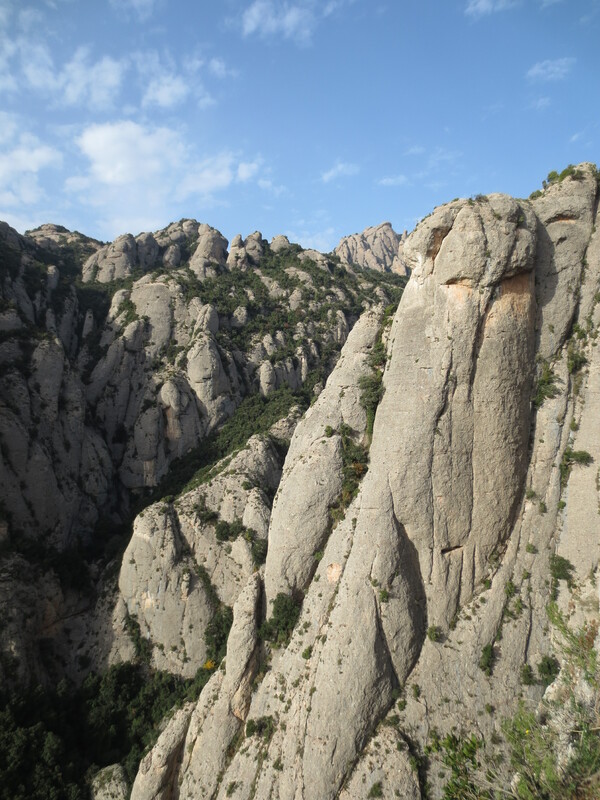 With a 20 minutes’ walk we reach the base of the Roca Ponent and from there we have to walk up a steep path with a lot of loose stones: better not to leave a big distance between you and your partner while walking up to reduce the risk of hitting him/her with a stone. The route Vendetta is the first line of bolts from the left (there are two or three more routes on the same wall). 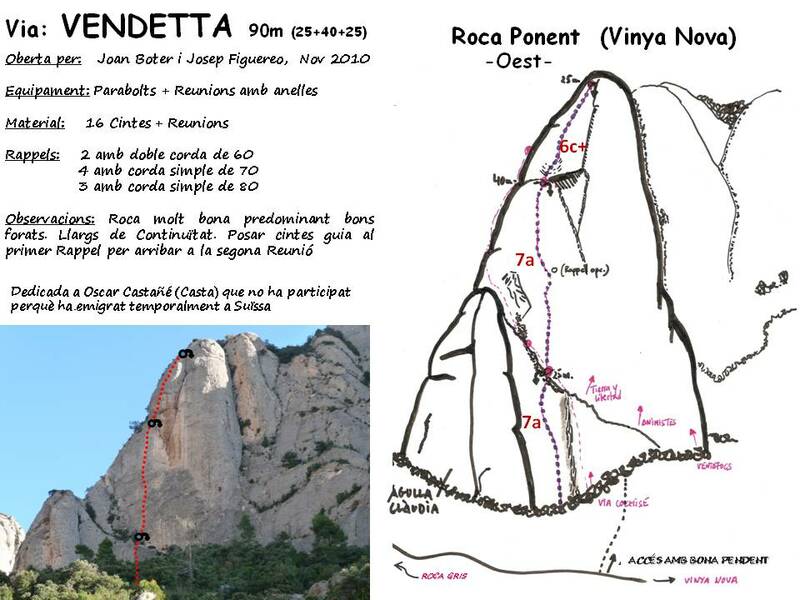 The route is 90 meters long, has three rope lengths (7a, 7a, 6c+) and is very well equipped. You just need 16 quick-draws and a single rope to climb it. We start climbing around 1:00 pm, when the sun starts to warm up the rock (west facing). 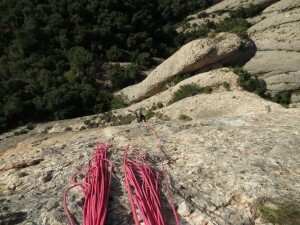 It’s a really perfect day with sun and clouds, no wind, good temperature for enjoying climbing in the sun without freezing nor sweating neither. So good! The first pitch seems quite bouldery to both of us, with a single hard sequence on a vertical wall at the beginning and then easy on slab with good holds. 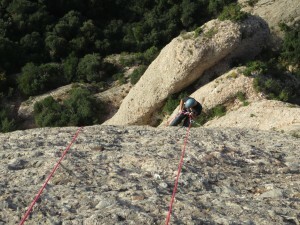 The second pitch is a fantastic 40 meters vertical wall on good, medium, to small pockets. Good endurance is required! 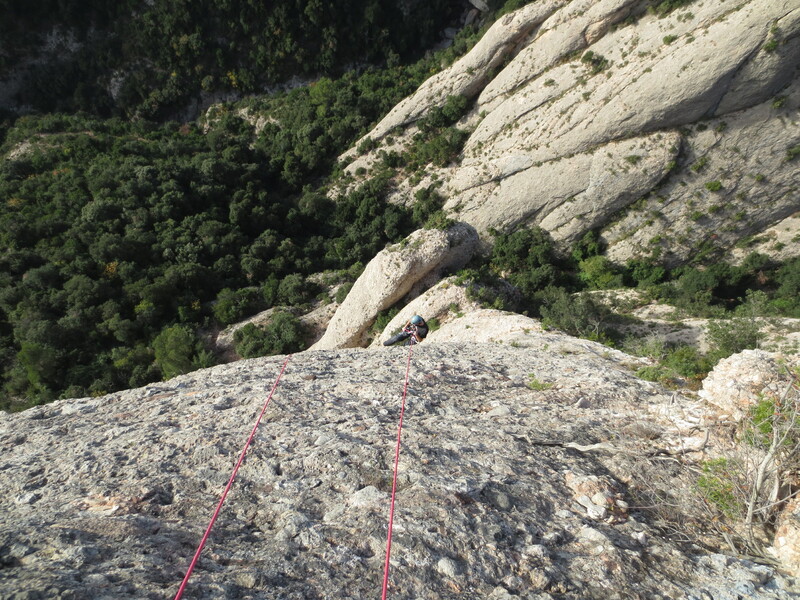 The last pitch starts a little bit uncomfortable on overhanging not very good rock, but the bad feeling is immediately over when you end up climbing on an aerial and very compact slab with a wonderful view down to the valley. We manage the descent with three rappels (we have a 100 m rope) to the ground. 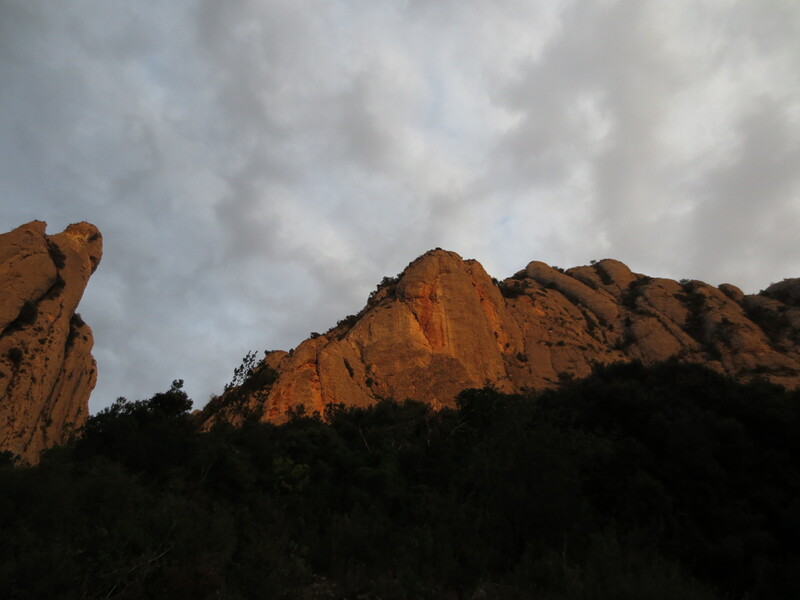 At the end of the day, we enjoy a spectacular red sunset on the wall we have just climbed.